“Tools of the Trade” is an ongoing series highlighting antique weapons/equipment pertaining to Western swordsmanship. It will feature hi-res photography and statistics, but also will address the tools from a martial artist’s point of view. Click on each image for the full resolution. Should You be Training with an Extra Heavy Sword? “The Art of Translation” is an ongoing series of articles covering translation as it pertains to HEMA source material. It will feature tips, resources, original translations and more. An American woman was visiting Italy enjoying her delicious gelato. Her conversational Italian was quite good, and she complimented the store employees on how much she liked her frozen treat, informing them that in America, ice cream is full of preservatives. Everyone in the store turned to look in revulsion. It took a short discussion to figure out why they had reacted so strongly. She had used the Italian word, “preservativo”, which she correctly understood to literally translate into English as “preservative”. The problem, though, is that Italians don’t use that word to mean additives in food… they use it to refer to prophylactics. She had told everyone in the store that Americans put condoms in their ice cream. What are we REALLY seeing with the half-sword images of Talhoffer? 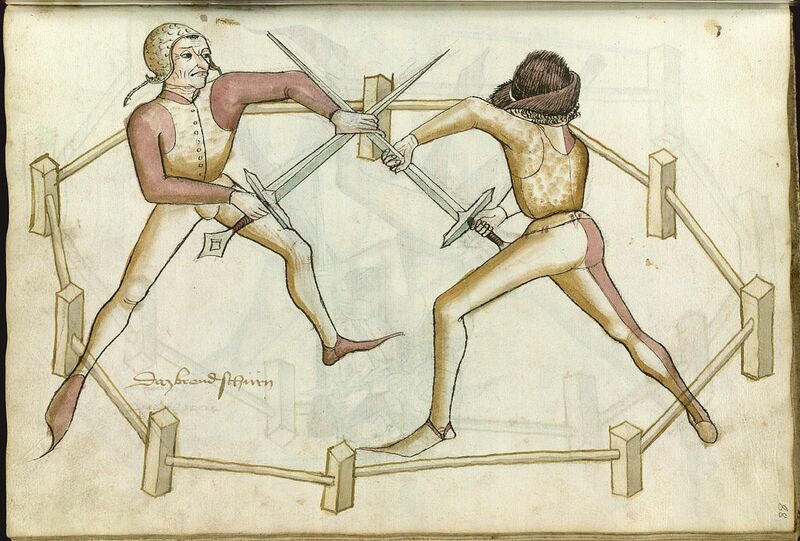 It is easy to assume Talhoffer was being literal when showing these men half-swording without armor. But is that what he really intended?